The legal weed market is a boomin’. Along with it, a burgeoning tech sector has sprouted up around the fast-growing cannabis economy. From Colorado to Massachusetts and the more than two dozen states in between where weed has been legalized in some form, there’s a dank cornucopia of innovative tech companies and startups reimagining how the weed industry does business and engaging its swelling base of regular consumers. North American legal marijuana sales totaled $6.7 billion in 2016 and more than $10 billion last year. Cannabis market research firm New Frontier Data projects the industry will top 255,000 jobs by 2019 and reach $24.5 billion in sales by 2025. In that broader context, cannabis is just another kind of product, surrounded by every kind of ancillary business of which you can think, and wrapped in an ecosystem of apps, services, and software. Consumers expect to buy their preferred strains, edibles, or oils as conveniently as possible, either through online shopping on-demand delivery, or in dispensaries at the point of sale. Budtenders and ganjapreneurs need customer relationship management and marketing automation platforms to keep track of their product catalogs, manage the books, and keep customers coming back through deals, promotions, and loyalty programs. Growers and manufacturers need seed-to-sale systems to oversee compliance and make sure every plant and product is accounted for. This only scratches the surface of all the apps and technology flooding the market. The joyous 4/20 holiday is a ripe opportunity to highlight some of the most innovative tech companies and successful startups in the industry right now. They are tackling everything from social media and business intelligence to vaporizer tech, strain DNA mapping, and DIY growing for cannabusinesses and THC lovers alike. During the early morning hours of July 1st, Nevada became the fifth state in the contiguous U.S. to allow recreational marijuana shops to open for business. 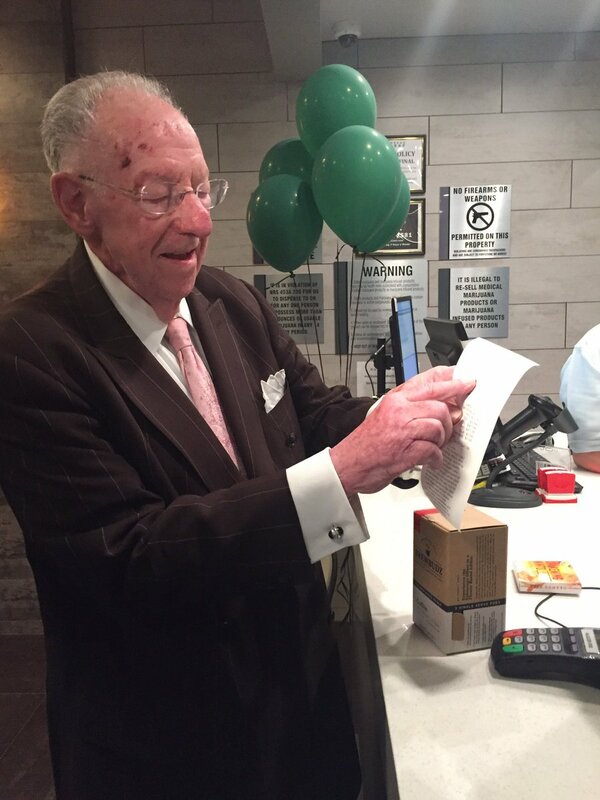 And, embracing the new normal, the former Mayor of Las Vegas Oscar Goodman and Nevada’s “Godfather of Weed” Sen. Tick Segerblom were anxious to participate. As legal weed became easily accessible late Saturday morning in the Las Vegas Valley, an aromatic bag of cannabis-infused coffee was high on the shopping list for the one-time mayor of Las Vegas. Also waiting patiently on the historic day, Sen. Tick Segerblom was first in line at The+Source in Las Vegas. Anticipated to generate more than $60 million in new taxes for schools and the state’s “rainy day fund” over the next two years, all recreational marijuana sales will be hit with a 15% wholesale excise tax and a 10% state retail tax. While you can now legally drive with up to one ounce of weed or 3.5 grams of concentrates in your car, those busted “riding dirty” still face the unfortunate reality of pleading before a judge on DUI charges. Another expensive marijuana faux pas, smoking in public: Individuals caught smoking in public will be subject to a civil penalty not to exceed $600. Now overseen by the Nevada Department of Taxation, rather than The Nevada Division of Public and Behavioral Health, in-state and out-of-state medical marijuana patients will be exempt from the state’s 10% retail excise tax on recreational marijuana sales. Back in November, Denver voters passed Initiative 300, where Denver businesses can apply for permits to allow for public cannabis consumption on their premises — the first of its kind in the nation. Initiative 300 calls for the rollout of a four-year social use pilot program that will now launch in the coming months. Denver businesses hoping to acquire a permit for a social consumption area will be able to submit an application until the end of August. Permits will be available on an annual basis for brick-and-mortar businesses or a temporary basis for event organizers. If a business has their application for a permit approved by Denver’s Department of Excise and Licenses, the fees will amount to $2,000, though it is not yet clear how much of that fee would have to be paid in subsequent years to renew a permit. Which types of businesses are expected to participate? While coffee shops and restaurants figure to claim many of the social use area permits in Denver, there are a surprising number of other businesses interested in catering to their cannabis-loving clientele. There has been tremendous interest from yoga studios, gyms, bookstores, and other establishments where people who love marijuana also love to spend time. Business owners hope the intersection of cultures will enhance the experience for some of their customers and create increased brand loyalty. Who is prohibited from applying for a permit? Businesses already permitted to cultivate or sell marijuana in the City of Denver will be prohibited from applying for a social use permit, as will restaurants and bars that hold liquor licenses. However, there is a loophole that will allow one business to hold a social use permit and a liquor license, provided the business does not serve alcohol while the social use area is actively being used. This means a bar could host a cannabis-driven event after hours when alcohol sales are finished or during the day when the bar is closed. Businesses or events that operate on public property or land owned by the City of Denver will be barred from securing a permit as well, i.e. Red Rocks Amphitheater. What changes have been made to Initiative 300 since November? Another early provision of Initiative 300 would have called for businesses to develop a new ventilation plan should they allow vaping in their consumption area, a requirement that was deemed redundant considering the city’s current building and ventilation codes. Though there are still points of contention, such as advertising restrictions for cannabis events and relatively strict zoning regulations, both lawmakers and cannabis advocates alike can at least be proud that they’ve taken a giant leap in progressing marijuana culture forward in Colorado — and hopefully beyond.